Is democracy in decline around the world? If so, is it also the case in Myanmar? 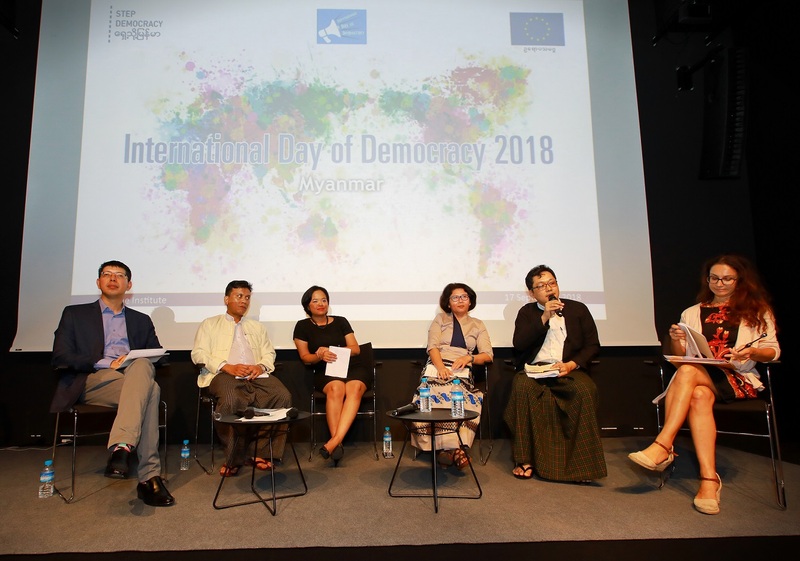 This year’s International Day of Democracy celebrations in Yangon were an opportunity to have broad ranging discussions on the state of democracy around the world. Prefaced by a presentation on global, regional and country level trends, International IDEA and the EU funded STEP Democracy programme brought together a panel of noted experts to discuss how human rights, representative government, access to justice and security, among others, fare in a contextualized and global light. After the event, the Democracy Fair showcased how International IDEA’s partner organizations across Myanmar are working to support its democratic transition. The basis for the event was the release of new data within International IDEA’s Global State of Democracy indices. Developed by International IDEA and financed by Sweden, the data was first launched in the 2017 Edition of The Global State of Democracy report, with new indices covering 158 countries. The Second Edition of the GSOD Report will come out in November 2019. The past decade has seen a number of democratic gains in Myanmar. These begin to become apparent within the indices since 2009 and the beginning of the opening by the military regime with a noticeable spike in 2015 with Myanmar’s historic elections. While in 1975, Myanmar scored in the bottom 25 per cent of all countries in the world on representative government, the gap with the Asian average has begun to narrow significantly. Since 2015, gains highlighted include Myanmar out-performing the global average on the indicator ‘Clean and Fair elections’. The data also shows that Myanmar is only one of 14 countries in the world that saw an improvement on this score in the past four years. Despite these gains however, there are remaining challenges to Myanmar’s democratic consolidation. This is shown by the indices as some dimensions show a slowing increase, while others are showing a plateau or even a decline. While these might not currently be statistically significant, they point to the onset of deteriorating or stalling reforms in some areas, including media integrity and media freedom. For International IDEA, a critical and free media is a crucial dimension of a vibrant democracy as the media plays a key role in scrutinizing and monitoring power and government authority and accountability. Enabling the media to do that is therefore of vital importance for democratic consolidation and to ensure that democratic gains do not see a reversal. Reflections from speakers noted that the road to democratization is a challenging process and that it takes time to build strong and robust democratic institutions, including a strong civil society and media, and that patience and perseverance is required on all sides. Following the presentation, civil society activists contextualized the GSoD data presented. Min Zin, a founding member and the Executive Director of the Institute for Strategy and Policy, became engaged in democracy work as a high school student and activist in Burma’s democracy movement in 1988. Dr Sai Khaing Myo Tun, a Lecturer at the International Relations Department of Yangon University, is actively involved in education policy reform and in teachers’ unions. Ying Lao, Deputy Director at the Salween Institute for Public Policy, brought her expertise as an Advisory Team member to the Shan Women’s Action Network (SWAN). Ma Thida, who has published under the pseudonym Suragamika, is a Burmese surgeon, writer, human rights activist, a prisoner of conscience, and head of PEN Myanmar. The moderator of the discussion, Zeya Thu, is the CEO, Publisher, and Deputy Chief Editor of The Voice Weekly Journal/Living Color Media. STEP Democracy and International IDEA’s office in Myanmar would like to thank Annika Silver-Leander, Head of Democracy Assessment and Political Analysis (DAPA) unit at International IDEA for her insightful presentation on the global, regional and country specific trends. Thanks are also extended to Johan Hallenborg, Head of Section Office from the Embassy of Sweden who opened the event and to EU Ambassador to Myanmar, Kristian Schmidt for his thoughtful words to close the event and launch the second phase of the STEP Democracy Programme. Shana Kaiser currently works in Myanmar as the Programme Manager for STEP Democracy, funded by the European Union. She was previously responsible for programming in Tunisia and across the West Asia and North Africa (WANA) region with a special focus on electoral processes, youth engagement, political participation and representation and overall programme management.